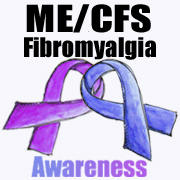 In 2010 I was diagnosed with ME/CFS (Myalgic Encephalomyelitis/Chronic Fatigue Syndrome) and later Fibromyalgia. At my worst I can be totally bedridden for days (or weeks) and unable to care for myself. I live on my own & I have no carer. I suffer severely from brain fog – inability to concentrate or to focus on what I am reading - so I cannot handle computer work or reading for very long. I often get dysphasia where I jumble up what I process. I tend to jumble my words (especially when I am really tired or distracted) often without realising it so it’s not ideal when socialising and I rarely use the telephone anymore. I suffer severely from sensory overload – mainly sounds and lights (and certain odours) – and now from anxiety – so I cannot handle being in noisy environments or being around groups of people. I also have a compromised immune system so I pick up viruses and infections very easily. Due to these issues I have virtually become a bit of a recluse. I am mostly housebound now and venture out of the house possibly once or twice a week for only a few hours at a time. Apart from severe fatigue & insomnia – my body clock is totally messed up (I can sleep for days on end or go for days and days without sleeping). I feel like I am in a constant state of jetlag. I’m not a fan of sleeping pills so try to restrict them to once or twice a week just to try to regulate, or catch up on my missing sleep when I get caught in an insomnia cycle. I refuse to drive when I am like this because I don’t want to put myself or anyone else at risk. Chronic Pain – unfortunately I am on very high doses of pain killers just to be able to function. Without them I cannot walk. I had an accident many years ago which has left me with nerve damage to my neck, shoulder & spine. When my fibro flares up it likes to target these weak areas and magnify the pain a zillionfold. Energy – I never have enough of it! I suffer from a severe lack of energy and extreme post exercise malaise. My body cannot generate the energy that it needs to function. Small amounts of exercise - for example just walking to and from the letterbox - can leave me exhausted sometimes so I have to plan my outings very carefully. For example, driving to & walking around the supermarket, and then unpacking my groceries when I get home is the equivalent of running a marathon for me and will require recovery time. I have had to severely simplify my life and cut back on doing a lot of things that I formerly enjoyed, just so that I can cope with my changed circumstances. I have so much “down time” and spend the majority of my time at home. The positive is that at least now I have time to spend on hobbies. As I am socially isolated, my primary source for contact with the outside world is online (mainly Instagram and Facebook). Quilting has brought much happiness back into my life. It helps me to escape from my reality and to surround myself with colourful, happy things. Some days I can manage to sew for hours, and some days just for a few minutes. Some days I know that if I try to sew I will just end up having to unpick it all! I spend a lot of “down time” which is where I am literally confined to bed or the couch. I do not sew in bed but I always have something within access of the couch to work on. It might be appliqué (I prefer needle turn appliqué); embroidery; cross stitch; hand sewing binding on to a quilted project; Hexies; English Paper Piecing (EPP); or hand quilting. I tend to hand sew a lot at night when I’m watching TV but some days I just cannot manage to sit at the sewing machine so I settle for a hand sewing project instead. I have to be careful when I cut out a project. I NEED to make sure that I am fully functioning so I often cut out a few projects at a time and let them sit and wait until I am able to sew them. Cutting when suffering from brain fog or dysphasia can be VERY EXPENSIVE!!!!! I have learnt this the hard way. Also I cannot stand for long periods of time so I need plenty of rest breaks (I sometimes refer to them as “Instagram breaks”). I don’t talk much about my health online, but I do mention on my Instagram profile & blog that I have “ME/CFS & FM”. I have had many people approach and introduce them self to me who either suffer from or know of someone who suffers from one or both of these conditions and I have developed some extremely close bonds with many of these people. Their comments are often extremely encouraging and uplifting. Despite my down days and my limitations, I always try to look for the silver lining in every cloud - if I hadn't lost my health, I wouldn't have had the time to reconnect with my creative side or to meet the many wonderful quilters that I have met online. Tomorrow I look forward to showing you some of my work. Facts and information for family and friends who want to understand what it means to have ME/CFS. thank you for your support Heather. I don't tend to discuss my health issues much.